I'm happy to share a new tool to help you make your web analytics life easier: the free Online Analytics Maturity self-assessment survey. Basically, trough a couple of very simple questions - I like when things are easy - you will get an idea of why web analytics might be hard for you. We keep hearing "web analytics is hard". From the definitions above, we can see "analysis" primary objective is to make things easier. Nobody's job is supposed to be easy - if you really claim to be an analyst, stop complaining: your job IS to break apart complex topics and processes, understand them, and make them easier! I have received tremendous level of constructive feedback from practitioners, agencies, vendors, academics, business analysts and others since I drafted and proposed the first version of the Web Analytics Maturity Model. This survey will help you, and me, pursue the work on making web analytics easier by documenting best practices and helping you, your stakeholders and colleagues understand a bit more about online analytics. Any self-assessment is necessarily biased - but this is a start - as with any tool, exercise your judgement. Note this survey represents a subset of a full maturity assessment exercice. Should you want an independent, professional evaluation and specific recommendations for improvement, please contact me. This survey will assist you in evaluating your current online analytics maturity and point out what are the key process areas at risk. 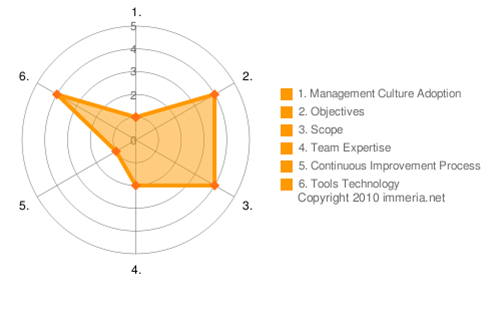 It is based on the first version of the Web Analytics Maturity Model (WAMM). The collected data will be analyzed and will contribute to the Online Analytics Maturity Model (OAMM) future releases. Once sufficient data is collected, it will be the first such study of online analytics practices within organizations of various industries, sizes, geographies and organizational structures. Get started! Fill out the OAMM survey and please, spread the word!